You are here: Home / news / Sébastien Léger ‘Funky Tech House’ + Sample Giveaway! 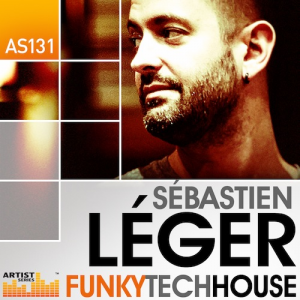 The exceptionally gifted French producer, Sébastien Léger, joins the acclaimed Loopmasters artist series, delivering a superb Tech House sample collection, loaded with Funk! ‘Funky Tech House’ includes 268 Loops 419 One Shots & Multi Sampled instruments dedicated to all Tech House producers looking to funk up their productions and comes pre-loaded with over 1.5 GB of Lo Slippery Basses, Funky Tech Beats, Infectious Music Hooks, Syncopated Percussion and Modulated SFX. Born into a musical family Sébastien attended the academy of music from the age of 5 to 15, integrating technique and musical theory on piano and drums. Soon inspired by the likes of Ian Pooley, Daft Punk and Sneak, Sébastien stepped behind the turntables and by 1998 had started producing his own funk induced techno with his first EPs under the alias Deaf’n’Dumb Crew. In 1999 Sébastien and his business partner established the labels Cyclik, Subkroniq, this year also saw his first album “Atomic Pop” featuring Junior Sanchez released on Black Jack Parallel to building his international DJ career Sébastien Léger is becoming of the world´s most demanded remixers, working for artists like Armand Van Helden, Kevin Saunderson, Ron Carroll, Jakatta and Defected whilst his own productions can also be found on famous imprints such as Mistakes Music, 1605, 100% Pure, Carl Cox´ Intec, Defected or Josh Wink´s Ovum, just to name a few! The Collection is also available in Apple Loops, Ableton Live Pack and Reason Refill, available separately. One of the most outstanding French artists in recent years Sébastien Léger’s take on Electronic music goes far beyond the French filter house clichés, his aim has always been to innovate and not imitate and now is your chance to sample Sébastien Léger – Funky Tech House. FREE GIVEAWAY! Download a free sample pack taken from ‘Funky Tech House’ here!